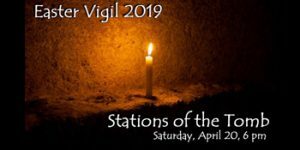 Stations of the Tomb: Holy Saturday, April 20, 6 PM. After Jesus breathed his last on the cross, after the chaos of the earthquake and the torn veil at the temple, after darkness fell, there was a deep pause as if all creation held its breath. Stations of the Tomb is an interactive, family-friendly worship gathering for all ages. We will explore the time between the cross and the resurrection. Place yourself in the upper room with the disciples, reflect on your lenten journey, and listen as the story of God is recounted. Experience the ancient christian traditions of Holy Saturday– And cultivate your faith in a multigenerational environment that celebrates all Christ has done, is doing and has promised to do!